"Africa changes you forever, like nowhere on earth. Once you have been there, you will never be the same. But how do you begin to describe its magic to someone who has never felt it?" "Alone we stand, together we RISE"
The retreat takes place over six days and five nights from Monday 9th March to Saturday 14th March 2020. Watamu Treehouse is a truly unique retreat centre situated on the nicest and quietest part of Watamu Beach – a beautiful stretch of white sand and warm blue water on the Kenya Coast. Staying at Treehouse is unlike any other Coastal house or hotel. Watamu Treehouse has featured prominently in social media and in local and international press. In 2015 Harper’s Bazaar UK listed Treehouse first in their feature “THE WORLD’S BEST TREEHOUSE HOTELS”. And in 2016, the Telegraph Travel included Treehouse amongst their “BEST HOTELS IN KENYA”. The “Treehouse Effect” of a peaceful restful break combines: beautiful and unique accommodation. Healthy and fresh meals. Yoga and treatments with a view, beach and adventures in nature. Treehouse is comprised of two separate towers. KASKASI (NORTH) TOWER has three double rooms - each one is self-contained with its own double bed, bedroom, balcony, toilet, and shower. Two of the bedrooms have beautiful 360 degree views of the sea and forest and all of Watamu - including the sunrise, sunset, moonrise, stars, etc. The third bedroom has an incredible view of the forest and sunset. The house also has a kitchen, living/dining room and rooftop lounge area. There are additional sleeping areas. KUZI (SOUTH) TOWER has 4 bedrooms, and all the rooms have 2 or 3 beds, balcony, bathroom, shower and private dining space. All the bedrooms have incredible sea views, and three of them also have views of the sunset and forest. The house also has a kitchen, two group dining areas, plus lounges and additional sleeping space. All bedrooms are unique, refreshing and inspiring. Made with all local materials and dalles (recycled glass). Wifi is installed at Treehouse, it works most of the time, certainly fast enough to stay in touch. However, to get the most from this retreat we recommend you disconnect or to think about minimal usage. Treehouse has a pool and own private path through the forest straight down to the beach, and walking through the natural forest is one of the best parts of the Treehouse experience. 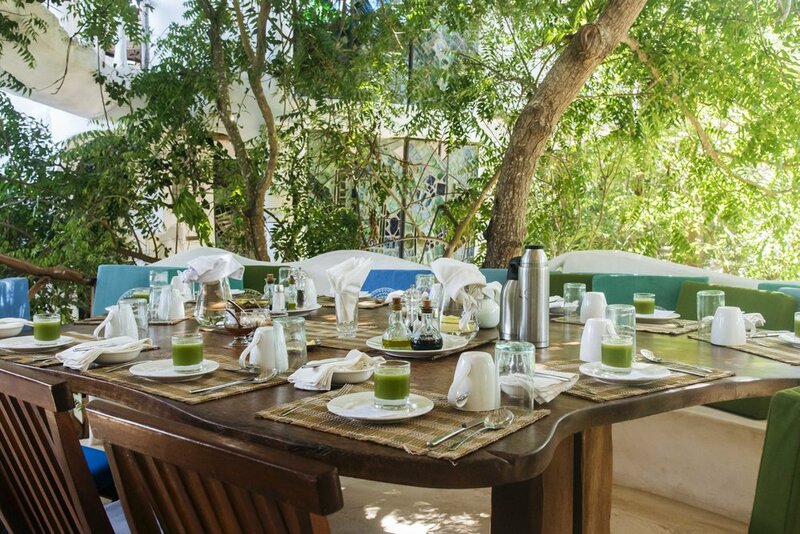 Treehouse is not a spa, but the health experience offered is nutrient rich fresh food, regular swimming, walking, yoga, nature, massages and deep sleeps. Be spiritually nurtured by the energy that Ottilie Wellness and Charlie Morgan will offer you. Watamu Treehouse is a peaceful home for wellbeing on the Kenya Coast where guests can be alive, be strong, be fit, be relaxed, be happy, be present. JUST BE. Existing in harmony with the natural environment, connecting with yoga, meditation, adventures and rest so you can activate your radiant self through body, mind and soul. "If I have ever seen magic, it has been in Africa"
The food offered at Treehouse is healthy fresh and delicious. 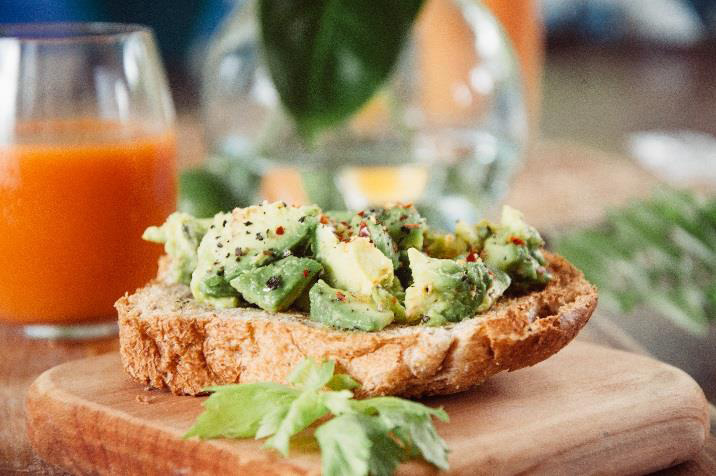 The menu offered through this retreat will be a mixed of vegetarian & vegan. As you are on the coast in Kenya there is nothing like the freshest seafood on offer. All meals will be tasty and freshly prepared catering for dairy and gluten free. Mostly sugar-free, but there is the treat of the best Italian gelato on the coast. A nice 5km walk all along the beach with the gelateria as the destination is definitely worth it! Lunch delicious and nutritious soup, salads and main courses including whole grains and proteins - and a daily glass of madafu - FRESH coconut water! Supper again a healthy dinner. 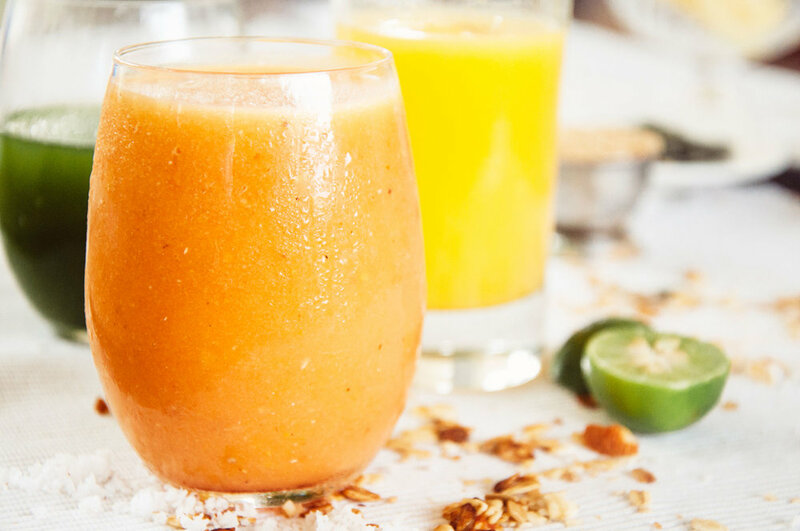 Mostly wheat-free, nutrient-rich, very fresh and energizing. Watamu Treehouse is the perfect place for relaxing and energizing yoga. In harmony with the elements, nature is a huge part of this RISE African Yoga Retreat. 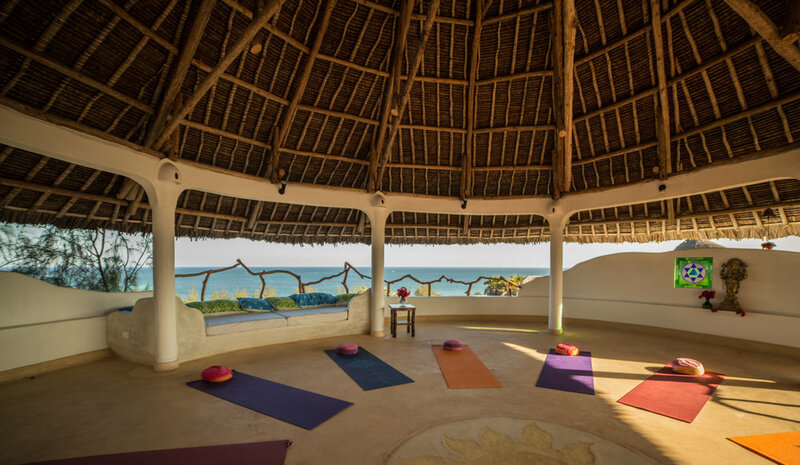 The very top floor of Treehouse has a 360-Degree Yoga Room - purpose built for yoga at the highest point in Watamu. Literally salute the sun - hence the retreat theme RISE. You are always surrounded by the sun, the sea, the forest, this is truly a unique offering experienced nowhere else in the world. Other areas you will experience your yoga session during this week could be on the exposed sandbars, in the forest , on paddle boards with the sunrise, sunset , or moonrise - there are endless places to do yoga in nature. Amazing! I love Charlie and think she is a wonderful teacher. I especially loved that it wasn't just 'asana' focussed and while we were given dynamic practices in the mornings, restorative options were offered in the evenings to help balance us out. The workshop style inviting journalling, introspection and various life assessment skills is just what should be offered on a retreat, as it was a safe space to explore and come to terms with what was, what is and what will be. This kind of work is so important for growth and having the right place to explore it makes it more potent. Email hello@ottiliewellness.com to enquire about deposit and payment options. Cost excludes: flights, travel insurance, travel vaccinations, personal toiletries, laundry service, tips for staff, individual expenses (gifts) sodas or alcohol, spa treatments, life coaching sessions and extra activities. “We are both keen travellers who love nothing more than a new adventure and we know a beautiful and inspiring location when we see one! Sam & Kate want your stay to be a life-changing experience you share with similar souls.
" …all of the qualities that the activities, fine dining, indulgent massages and aesthetic beauty that The Treehouse and Watamu had to offer, was only magnified by the shining lights that are Sam and Charlie. Their hospitality and desire to ensure we all left this retreat with a relaxed mind, a looked after body, and a new outlook and vision of our own was so authentic and heartfelt. Organising a wellbeing retreat is no easy task but Sam did it from the depths of her heart and every detail was seeped in thought - from the ‘goodie bags’ awaiting our arrival on the beds, to the special birthday celebration I was surprised with, and her genuine interest to make each and every guest comfortable, thought of, and cared for on a personal level." *There will be an opportunity to book excursions and spa treatments at an additional cost - details and plans can be organised once your booking confirmation has been received. Although being in Treehouse feels as if you have stepping into a dream, is it still very accessible. From the International airport, Nairobi, you can access Treehouse via a simple 1 hour flight to Malindi Airport and then a 25 minute taxi ride. You can fly to Malindi with Fly540, FlySax or Air Kenya. (last 2 from Nairobi Wilson Airport not international) However, this is a 30 minute taxi ride from Nairobi International airport. Or you can fly into Mombassa - all the airlines above plus Kenya Airways and Qatar have flights. Transfer can be arranged from Mombassa to Treehouse, however please note this is a 2 1/2 hour drive by taxi at at your own costs. You can do one way Malindi and one way Mombassa by buying one way tickets - there is no price advantage of buying a round trip. Ottilie Wellness do not offer an international flight package with this retreat. So it is the clients responsibility to get themselves to Malindi airport and transfer to Treehouse can be provided. The retreat will official begin at 6pm on Monday 9th March 2020. We want you to enjoy this week to the fullest life changing experience you can, therefore, it is up to you, whether you want to join for walks or take a nap, sit by the pool, swim in the ocean or read a good book. We recommend that you attend all the yoga classes to get the most from the week but if you feel your body needs a break we respect this. The RISE 2020 African Yoga Retreat is time for you, your self-care and chance to embrace the richness life has to offer. Full details of what to bring, forms for dietary requirements, emergency contact details and booking treatments will be sent nearer the time after you have made your booking. All clients booking must have necessary immunisations and travel insurance. A copy of your insurance must be supplied to Ottilie Wellness two weeks prior to retreat date.